This is a remarkable effort for a first novel! It is so well-written. The story is told in the first person, and it's completely from Eleanor's point-of-view. We see the world entirely as she sees it. Eleanor is severely damaged, both mentally and physically because of the trauma she experienced daily for the first ten years of her life. When we meet her she is 30 years old, living on her own, working as an accounts receivable clerk in a graphic design company located in Glasgow. The remainder of her childhood was spent in foster care for 7 years and then she attended university on a scholarship and graduated with a first in classic literature. She manages her PTSD and chronic depression by keeping herself to a constant routine, and with the help of her weekend vodka binges which she swears helps her sleep. Then she meets an "IT guy" at her workplace by the name of Raymond, and her whole world begins to change. As the story unfolds, we get the story of Eleanor's childhood, and we begin to fully understand her and her viewpoint of the world. This is an excellent portrayal of the frailty of the human psyche, and also the strength of human nature to develop the coping mechnisms required to get through the morass and bleakness that traumatic events have on our psyches. Highly recommended, and thank you to my GoodReads friend who recommended this book to me, after she had read my review of A Man Called Ove. 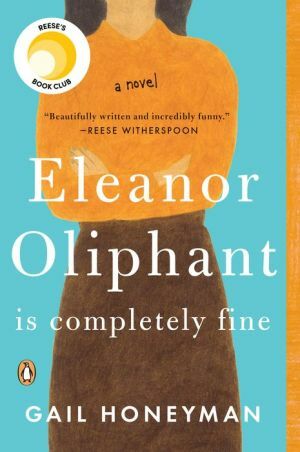 Eleanor Oliphant is Completely Fine is the first novel by British author, Gail Honeyman. At thirty years of age, and despite her degree in Classics, Eleanor Oliphant has worked a mundane office job in By Design, a graphic design company in Glasgow for nine years. She has no friends and the people she works with find her strange. But her life is well organised: completely fine, in her opinion, needing nothing. Until, that is, she casts eyes on musician Johnnie Lomond. This brilliant debut novel touches on childhood neglect, physical cruelty and emotional abuse, as well as repressed memories and survivor guilt. It highlights the value of a skilled counsellor and the importance of care and understanding, friendship and love. Recommended!